I love gumbo. Correction: I love really great gumbo. I find the dark, savory, indescribable goodness almost addicting. Gumbo is subjective, like pizza – some prefer crunchy, thin crispy crust, and others crave thick, doughy deep dish. 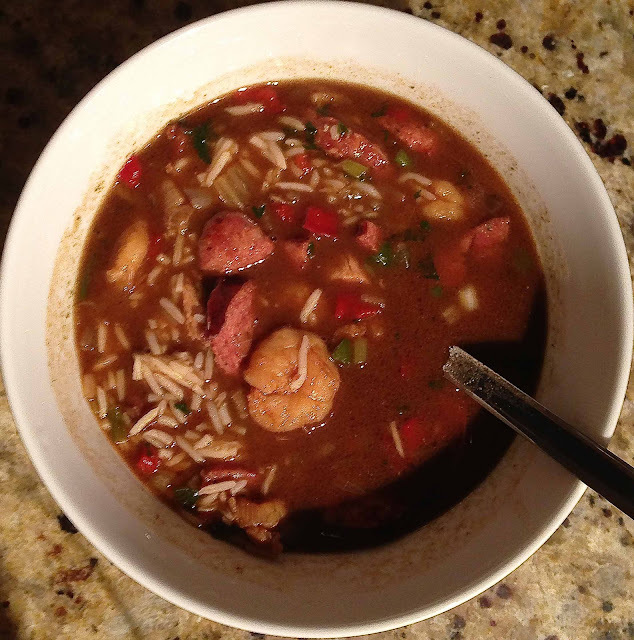 Gumbo has many variables, such as the darkness of the roux, fine or chunky veggies, and a combination of meats and seafood. To okra, or not to okra? I have sampled many gumbos, finding that the most popular Cajun or Creole restaurants do not necessarily make the best. As a matter of fact, I had some of (what I considered to be) the best gumbo ever at a tiny Tex-Mex seafood shack in Austin years ago. But the BEST gumbo is the tried and true recipe that you personally fine-tune to your own preference. So many variables, so many decisions… Do you like okra? It’s a great addition if you do. Gumbo z’herbes incorporates various assorted greens. Hate seafood? Leave it out – stick with chicken and sausage. Sometimes I add 2-3 different types of sausage just for fun. True seafood lovers like to toss in every piece of seafood they can find, from crab legs in the shell, to oysters to chunks of fish. I have even seen bone-in hunks of chicken wing in a gumbo. I understand the premise of cooking all the natural shell and bone goodness into the dish but - um, no thanks. I don’t want to slow down to crack crabs and debone chicken; either I’m just a lazy gumbo eater, or these are like speed bumps in my bowl. My energy is best expended savoring the dish. This is my own recipe that I came up with years ago, spawned by an innocent remark that I took as a challenge (“I don’t know if you can make a dark enough roux to make really good gumbo”. Hmmph. A leisurely stroll through several Cajun cookbooks, a lingering haze of smoke throughout the house, and a deep mahogany/chocolate roux later, a star was born. This makes a large batch of 8 or so generous servings. Louisiana/Cajun seasoning, such as Tony Cachere’s or Zatarain’s. ROUX (roo!) If you can find a jar of pre-made roux, this will save you some time and effort. For this recipe I use half of a 16 oz. jar, making sure to use half of the separated oil as well. If your grocer does not carry roux, it is easy albeit time-consuming to make, and you will need a half cup of oil (I prefer peanut oil) and a half cup of flour. Begin by chopping the onion, bell pepper and celery, either by hand or food processor. You may prefer larger chunks or tiny bits or somewhere in between. Combine into one bowl, and blend. Slice your sausages into ¼-inch slices. Make sure the shrimp are peeled and deveined, clean, gently dried with paper towels, and ready to go. Chop your chicken into cubes. Set these aside. If you choose to use okra, chop it up and sauté it in a non-stick skillet until the sticky little threads are gone. What is that stuff anyway, okra spit? Set aside for later, to add with the sausage. 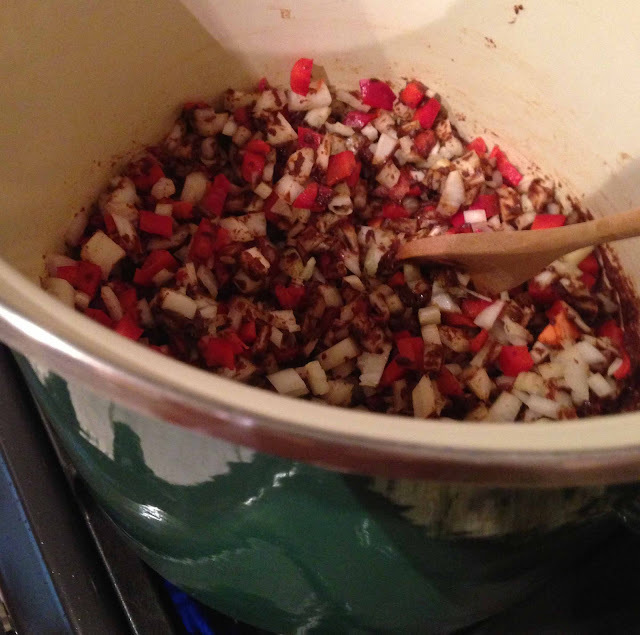 Once your roux is the right color it is time to add “the trinity”, your peppers, onions and celery. I tell you – if you have never smelled the point in time when the trinity hits the blazing hot roux, you have no idea what you are missing. It is the most amazing aroma, like nothing else in the world. Stir the trinity and roux until thoroughly blended. Cook for about ten minutes, stirring occasionally. Add the 2 quarts of broth, blend well, bring to a boil, and cut to simmer. While this is simmering, heat a large skillet on high. Dump the sliced sausage in. If you like really spicy sausage, feel free to shake some cayenne pepper over the slices. Cook until it begins to caramelize the edges, and then flip the slices. They will probably curl up – this is fine, it’s not a beauty contest. Once the sausage is good and seared, remove with a slotted spoon and toss it into the gumbo pot (along with the okra, if you wish). Don’t touch that dirty sausage skillet! Cover and simmer the gumbo for another 30 minutes. Time to make a batch of rice. And you know what else is awesome with gumbo? Garlic bread. After 30 minutes, reheat your filthy sausage-stained skilled to medium, and bring on the shrimp. Oh yes. Dump those bad boys in. Do you have your Tony Cachere’s handy? Season the shrimp generously as they cook. Once they begin to turn white/pink, it is time to flip them. Cook for only a minute more, and cut the heat. 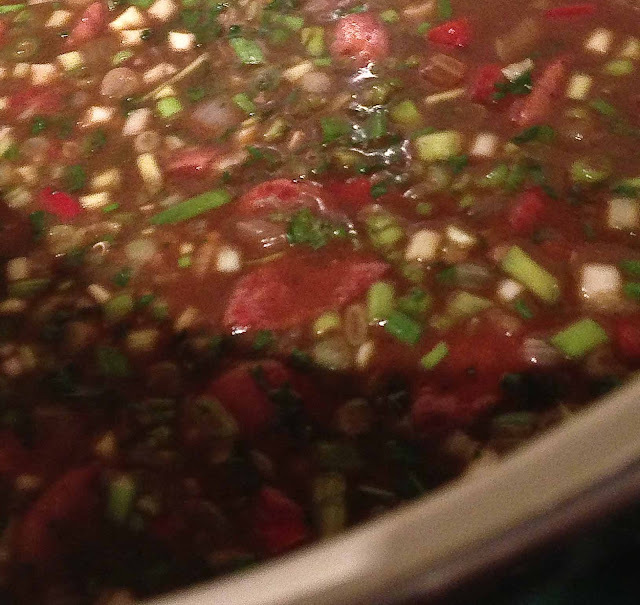 Scrape the pan of shrimp and sausage clingers into the pot with the rest of the gumbo gang. Add the chopped chicken as well. This is starting to smell RIDICULOUS. Stir the pot, and make sure it is only simmering, as we don’t want to overcook the shrimp. Chop your parsley and green onions. Add, and stir. Spoon a serving of rice into each bowl and generously ladle the steaming gumbo over it. Some folks like to add a bit of file’, and of course Tabasco is a close friend of this dish.